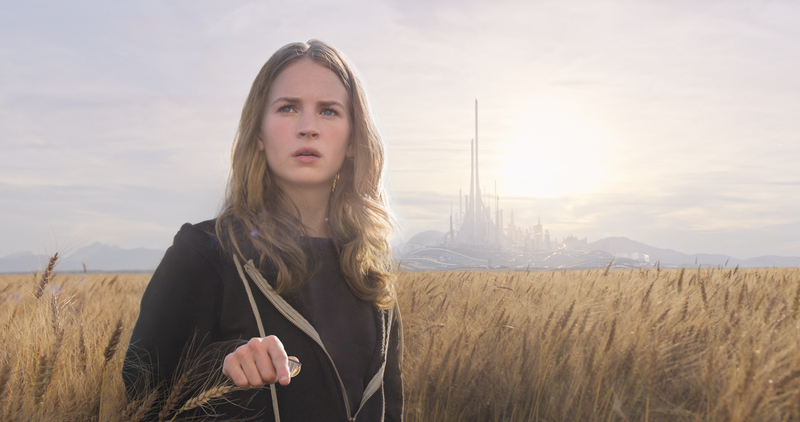 "Tomorrowland" reviews: Critics call George Clooney's blockbuster-hopeful "pedantic"
George Clooney's new futuristic fantasy drama Tomorrowland, directed by Brad Bird ("Ratatouille," ;"Mission Impossible: Ghost Protocol") has all the promise of an inspiring story -- but it's gotten less-than-inspiring reviews ahead of its opening weekend. Originally drawing enthusiasm from critics such as David Edelstein of New York magazine, who had claimed "'Tomorrowland' is the most enchanting reactionary cultural diatribe ever made," recent remarks are a little more restrained in their praise. "The forces of mediocrity have largely prevailed over 'Tomorrowland,' a kid-skewing adventure saga that, for all its initial narrative intrigue and visual splendor, winds up feeling like a hollow, hucksterish Trojan horse of a movie -- the shiny product of some smiling yet sinister dimension where save-the-world impulses and Disney mass-branding strategies collide," said Justin Chang of Variety. The sci-fi adventure follows the travails of Casey, a renegade scientific genius played by Britt Robertson, who stumbles on a portal into another dimension in where she discovers "best and the brightest" have gathered to solve the world's problems with rockets, robots and flying cars in a society styled in something of the aesthetic of the capital city in "The Hunger Games." Clooney plays Frank Walker, a reclusive scientist who had withdrawn from the world after his disheartening first encounter with Tomorrowland, but who reluctantly joins Casey as her cohort in their expeditions. Along the way Casey and Frank find Nix, played by Hugh Laurie, one of the questionable masterminds of Tomorrowland's architecture. The film's concept of an advanced society hidden in a parallel dimension came from Walt Disney's vision of a futuristic society that went into the design of their 1955 Tomorrowland attraction at Disney World which eventually evolved into Epcot Center. "We were always guided by Walt's original plan for Epcot: an actual 'experimental prototype community of tomorrow,' an ever-evolving laboratory to develop ideas that would improve the world," co-screenwriter Jeff Jensen told Entertainment Weekly. Director Brad Bird told Rolling Stone the Disney-produced project was shaped by Steven Spielberg awe-striking fantasy adventures such as "Close Encounters of the Third Kind" that poetically bridged science fiction with heart and wonder. Critic's are not quite as dazzled by Bird's magic and its message about creativity and activism as a number of them have remarked that the movie is more "pedantic" than poetic. The New York Times' A.O. Scott said "there are some logical -- and, I dare say, some ideological -- contradictions here, and a more serious problem of tone. The filmmakers want to dazzle you, but they also want to teach you a lesson." "Tomorrowland looks less like a magical city of the future, or even the Disney environment it's meant to evoke, than like an unusually clean and efficient airport, or the shopping mall beyond the multiplex where you're seeing the movie," Scott said. The problem, it seems to a number of reviewers, is that the movie ends up trying too hard to deliver a message about imagination, and less demonstration of it through its own artistry. "Instead of dialing up the fun, the filmmakers piled on with the lecture," Richard Roeper of the Chicago Sun-Times reviewed. "In the last few minutes of this movie I was reminded of my days as a student, when the semester was over and it was the last day of school, and the teacher was still lecturing us as the final bell rang. Enough. We get it. We need to do better. Now can we get back to the flying cars?"